In the previous post we started to discuss features and approaches to build Universal Applications. 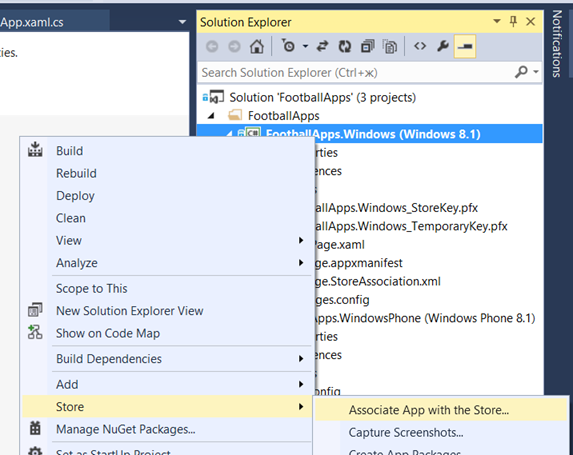 I am going to show that already today you may build applications which will be ready for Windows 10. And today we are going to discuss XAML. 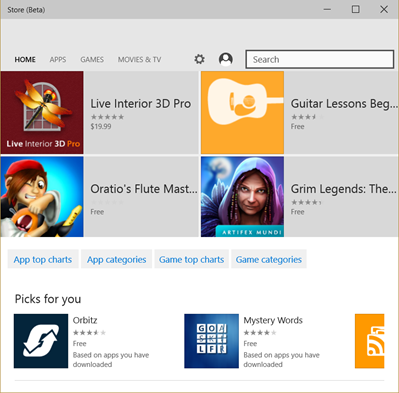 When Microsoft introduced Windows 8, Windows Runtime and Modern UI patterns, there were three things which developers needed to know about applications: all Modern UI applications work in full screen mode; 1024×768 is minimal supported resolution for Windows 8 devices; for resolutions 1360×768 and more Windows 8 allows to show applications in Snap mode with fixed width in 320 pixels. Based on these assumptions many developers designed interfaces for their applications in 1024×768 resolution using these parameters like minimal amount of available space for application. In case of Snap mode, many developers ignored it and tried to avoid to design something for 320×768 resolution. Frankly speaking I didn’t like Snap mode as well. Usually I showed a message like this: “Application doesn’t work in Snap mode. Please, move the application to Full screen mode to continue”. This messages helped me to pass certification. But everything is changing and Windows 8.1 added some more pixels to Snap mode. Today, default width of Snap mode for Windows 8.1 is 500 pixels. This amount is harder to ignore and that’s more important – Windows 10 allows to run Modern UI applications in window mode like legacy desktop applications. So in order to guarantee the best UX in Windows 10 you should think about smaller resolutions. 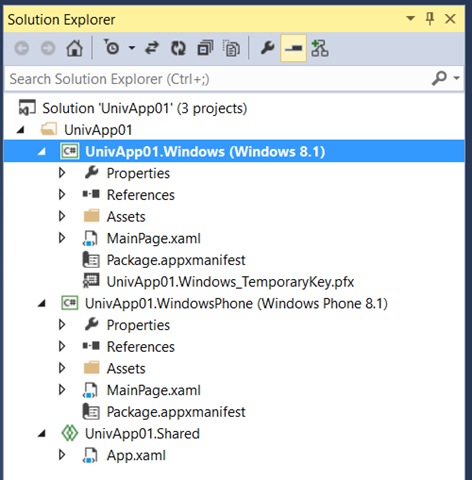 But there is a trick: if you already implement application’s layouts for small resolutions, can you apply it for Windows Phone application – I believe, so. Therefore, in case of XAML and layouts you can think about resolutions only because both platforms support almost the same set of controls. Right now, we are ready to change layouts depending on width of the window. So, it’s time to think how to make it. The best way to change layouts is using ViewStateManager there. 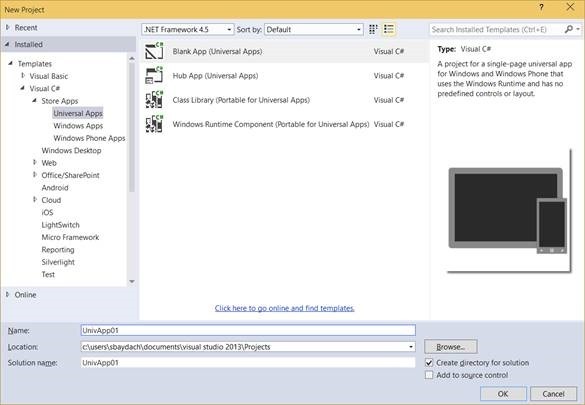 You can use it in XAML to define different visual state groups. Each group can contain Storyboard with animations inside. You can use these animations to hide or show some controls, change ItemTemplate, change controls’ properties etc. It’s easy to declare several groups for different resolutions and, thanks to animations, specify different look for each layout. As I mentioned before, you can change Visability properties, assign new ItemTemplate value etc. I believe that we can finish for today but I am going to continue the series and next time we will discuss DPIs and images. Lately I made a short overview of Notification Hub but the last article was mostly about some benefits of Notification Hub in comparison to “native” solution rather than its features. Today, I am planning to concentrate your attention on a step-by-step guideline, which will show how to use Notification Hub and will provide much more details about its particular features. 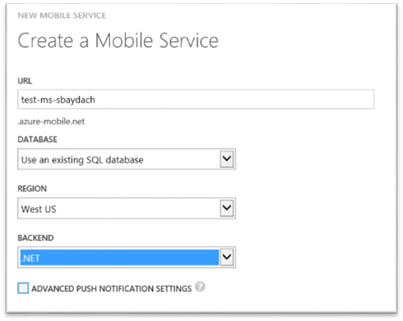 The first of all, we should understand that Microsoft has prepared several boxed solutions for common mobile scenarios, which are called Azure Mobile Services. However, Notification Hub service is NOT one of them. This service does not require Mobile Services and we are able to create it using App Services tab. However, there will be several opportunities, if we associate Notification Hub and Mobile Services. That is why I propose to start with Mobile Services and if we will create ones, Notification Hub will be created automatically for us. 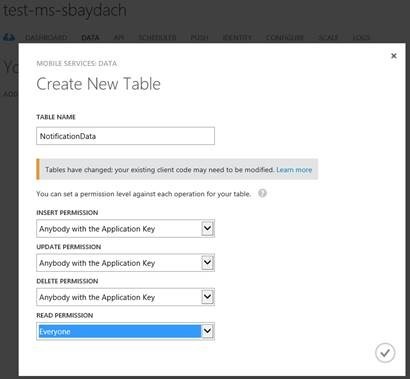 Pay special attention that you will not see registration endpoints section, if you select .NET as a backend technology. If you use C#, you will be able to set permissions WebApiConfig.cs file. We just discussed the security options and we mentioned application key and master key. 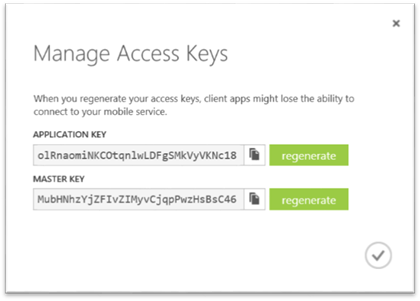 They can be found on Mobile Service dashboard and you can easily regenerate these keys in case of leaks. Of course, you should be aware of Media Services security options just in case of using Media Services client libraries but you can work with Notification Hub to avoid Media Services and it does not depend on whether your Notification Hub is integrated with Media Services in you subscription. If you want work with Notification Hub directly, you may forget about application and master keys but you will need to apply the policies of Notification Hub. In order to understand these policies, let’s go to Notification Hub dashboard (Configure tab). You can find there several access policies and you are able to modify them or create new ones. We should use these policies in order to connect Notification Hub directly. Additionally, there are two keys for each policy, which should be used for connection strings. You can find all the connection strings on the Dashboard page of Notification Hub and you can select one of them based on existing permissions. Of course, if you need a connection string for client devices, which will listen to notifications only, you can use DefaultListenAccessSignature connection string. If you create backend service, which will send Notifications, you can use a connection string with Send permission etc. Ok, I think that we can create a simple application, which will be able to receive our notifications. 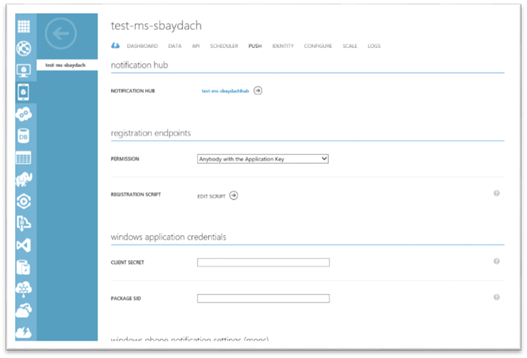 In order to do it I selected Windows Phone application (Silverlight) because this type of applications doesn’t require Store registration but it requires to turn on Enable unauthenticated push notifications checkbox on the Configure tab. It will allow to send up to 500 messages without certificate and this number is enough for testing. 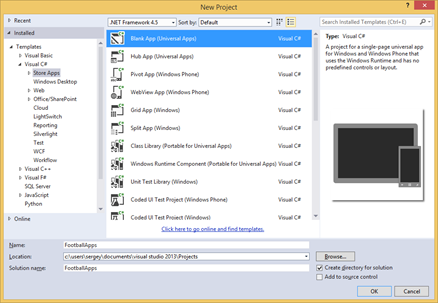 Let’s open Visual Studio and create Windows Phone (Silverlight) application. It will use old type of notification services unlike Windows Runtime applications but it will not require a certificate as mentioned above. We will try to communicate with Notification Hub directly as well as via Mobile Service. I will start with the direct method. 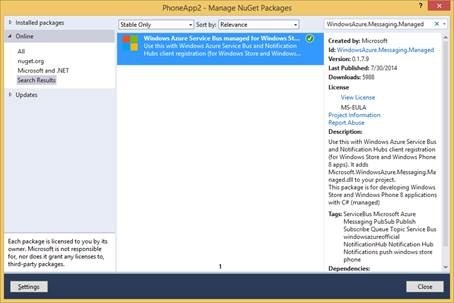 In order to do this you should use NuGet tool to add WindowsAzure.Messaging.Managed assembly, which will help you to send data to our hub because I don’t want to create JSon code as well as work with WebRequest and WebResponse classes. This code will allow to receive Notification Channel from the MPNS and update the channel in our Notification Hub. That’s all. You can run the application on your phone and try to send a message. 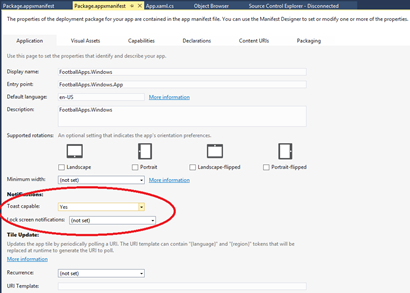 In order to send a message you can use the Debug tab on the Azure Management Portal. Pay your attention that this code doesn’t use connection strings from Notification Hub but it will not work if you don’t set Everyone permission to the registration pipeline (or put an application key as a second parameter of MobileServiceClient constructor). I think we can finish for today. 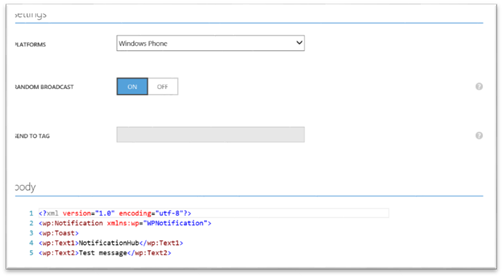 In the next article I am planning to create a Windows Runtime application as well as an application for sending push notifications.